Made from non-woven synthetic that is compressed, bonded, and impregnated with abrasives, Mebabrite(TM) mounted points are designed for light deburring, blending, and polishing. They feature medium/fine grits and soft/hard densities for smooth, chatter-free operation on precision machined and cast parts without changing their geometry. Points are available in over 150 industry standard A, B, and W shapes with 1/8 and Â¼ in. shanks, in aluminum oxide and silicon carbide abrasives. A line of synthetic mounted points for the light deburring blending, and polishing of precision machined and cast parts has been introduced by Rex-Cut Products, Inc. of Fall River, Massachusetts. 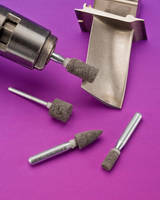 Rex-Cut® Mebabrite(TM) Mounted Points are made from a non-woven synthetic that is compressed, bonded, impregnated with abrasives, and designed for light deburring, blending, and polishing. Available with medium and fine grits and soft and hard densities, they provide smooth, chatter-free operation on precision machined and cast parts without changing their geometry. Ideal for finishing critical parts made from stainless steel, titanium, and exotic alloys, Rex-Cut® Mebabrite(TM) Mounted Points conform well to contours, radii, holes, and edges. Available in over 150 industry standard A, B, and W shapes with 1/8" and ¼" shanks, in aluminum oxide and silicon carbide abrasives, they are easy to dress to fit profiles and hard to reach areas. Rex-Cut® Mebabrite(TM) Mounted Points are priced according to configuration and quantity. Free samples and pricing are available upon request.